When it comes to your oral health, your routine at home is arguably just as important as seeing the dentist once every six months for a teeth cleaning. A good at-home routine is essential for preventing tooth decay and gum disease. But what is the ideal at-home oral care routine? It’s pretty simple, consisting of daily brushing and daily flossing. You can even elect to complement your at-home oral care routine by using a mouth rinse to further eliminate plaque-causing bacteria within the mouth. Remember, it’s never too late to start. Here’s a closer look at what your daily oral care routine should consist of. Minimally, you should be brushing your teeth at least twice per day. To do this, you should be using a soft-bristled toothbrush or an ADA-approved electric toothbrush. Be sure to use a fluoride toothpaste and try brushing your teeth at a 45-degree angle, gently and in small circular movements. Make sure you also brush your tongue and the area of your mouth where the teeth meet the gum line. While most people elect to brush their teeth first thing in the morning and then before they go to bed at night, it’s also a good idea to brush if you’ve consumed foods or drinks high in sugar. It’s also worth noting that you should be changing out your toothbrush every three to four months, as the bristles become worn and less effective over time. Flossing serves two very important purposes. One, it helps remove food stuck between the teeth that the toothbrush cannot reach. Two, it helps remove plaque buildup around the gum line, which can lead to gum disease if it’s not removed. On that note, it’s important to incorporate daily flossing into your oral care routine. It doesn’t matter what time of the day you floss, just so long as you commit to doing it. Though you should find the type of floss that you prefer, we recommend a waxed type for easy gliding in between the teeth. Gently slide the floss in between each tooth and up so it’s underneath the gum line. Make a few passes to ensure that you’re removing all of the plaque buildup that has accumulated. A mouth rinse isn’t necessarily crucial to a good oral care routine, but it can serve as a nice complement to flossing and brushing. Mouth rinse serves a couple of purposes, as it can help freshen breath, help eliminate acids and minimize plaque buildup. To properly use a mouth rinse, take the suggested amount and then swish it all around in your mouth before spitting it out into the sink. 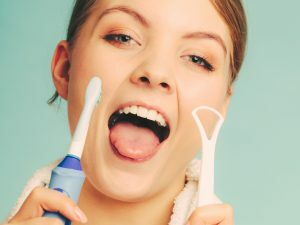 Finally, while a good at-home oral care routine is essential to a healthy mouth, you should still be seeing the dentist at least once every six months for a teeth cleaning. Also at these appointments, Dr. Agamov will conduct a thorough oral exam and recommend areas where improvements should be made when it comes to brushing and flossing. It’s at these appointments where any small issues that are detected can often be easily resolved before they become larger, more complex issues. Contact Alla Agamov, DMD General & Cosmetic Dentistry to schedule an appointment today! The two things I remember most about my dental implants are how fast and painless the procedure was, and how completely normal I felt the next morning. Now that the crown has been attached to my implant, It feels like my original tooth. Implants are the best thing I have ever done. I’m so glad my dentist told me about them. For the first time in 40 years I am able to eat steak and apples.